J. Spaceman is well known as the brilliant mind behind Spiritualized and one half of the creativity behind Spacemen 3. He has a reputation for crafting catchy pop melodies as well as introducing more noisy and avant-garde elements to a pop audience. Previously, during his time in Spacemen 3 with Pete Kember, A.K.A Sonic Boom (Spectrum, E.A.R) both Spaceman and Kember devoted themselves to psychedelic drones and used repetition and a very limited harmonic scope effectively to create, what has become, some very influential music. This release on Treader shows a return to those psychedelic roots in a collaboration with experimental pianist Matthew Shipp. The album is roughly 50 minutes in length and is made up of two tracks; 'Inner' and 'Outer'. The first track, 'Inner' is a 40 minute drone piece with a huge influence from early minimalism particularly La Monte Young's Dream Music which, early in his career Spaceman confessed his enthusiasm for. The track begins with Shipp's Harmonium playing a dissonant chord while Spacemans guitar distortion bubbles up from under the surface. The track continues continually shifting like glacier; subtle changes in Spaceman's guitar tone almost unnoticeable in the dense texture and Shipp's chord changes, so slow, that you hardly notice halfway through the track how much the tonality has changed. The piece can send the listener into a trance with it's thick texture, oscillating frequencies and glacial pace although it can be quite a challenging listen to those unfamiliar with drone music or to those not in the right fram of mind. The second track, 'Outer', is a welcome contrast to the first. Shipp, this time on a Celeste, introduces melody and for the first minute or so of the piece is the focal point. 'Outer' is a reaction to the dense prolonged drone of 'Inner' and leaves the listener with an enormous sense of space but lasts only a quarter of the time that 'Inner' does. Throughout the track, a structured improvisation, Spaceman reacts to Shipp's melodies; as they get faster, his guitar work becomes louder and more frantic. 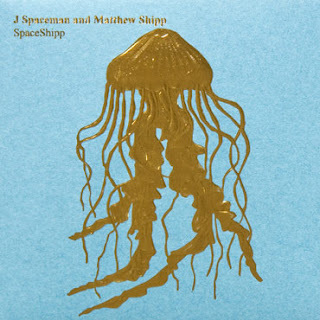 Just as Spaceman reacts to Shipp's melody, Shipp reacts to Spaceman's noise and about halfway through the track there is a brilliant moment when the two performances come together after the disparate first half into a coherent swell of noise and melody combined. After this the track then falls apart, as fragile as it was in the beginning. Overall this album is a great experience and well worth buying, if anything, just for the fantastic, signature Treader artwork. The two performers gel together well and the improvisations are fluid and, as a whole, coherant. This is a duo I would look forward to hearing more of in the future. On the 20th of April I was lucky enough to catch the duo at the Queen Elizabeth Hall as part of the Ether Festival at the Southbank Centre. Supported by the beautiful pianist Hauschka (who, as a one off performed with a string quartet) and performing under the name SpaceShipp, Spaceman and Shipp took to the stage quietly and almost immediately began 'Inner'. The first blast of the harmonium came as a bit of a shock after the average volume of Hauschka and the sound was carried through the stalls and seats to create quite a physical experience. Unlike on the album where both contributors compliment eachother, live, the focus was on Spaceman whose guitar thundered over the harmonium in a storm of feedback and noise. When 'Inner' began it was just a fraction of the voume it built up to be, with Spaceman's Starstream left in front of his amp stack to feedback while he set about shredding his telecaster, creating a wall of sound and a much noiser version of the album track. This noise almost drowned out Shipp but thankfully his dissonant work on the harmonium was just audible, underpinning and rooting Spaceman's guitar playing. Performance-wise the energy was palpable with Shipp swaying and occasionally standing up and pushing his hand back and forth across the keys while Spaceman's hand was almost a blur at times with the speed of his strumming. To compliment the psychedelic quality of the music there were just two dim spotlights which lit each performer and 3 large screens above them displaying a video of jellyfish out of sync with each other but played a few frames at a time creating an incredibly psychedelic experience. This complemented the music perfectly and it was easy to slip into deep contemplation or a trance like state with the sound physically affecting you as well as aurally and visually. Unfortunately this was ruined every time someone walked past to leave the venue, which was quite often towards the end of the piece as people who didn't have the attention span or interest in the music left. 'Inner' was played for just over an hour and when the wall was reduced to just a screech of feedback it was a great relief. During 'Outer' Spaceman was much louder and more pronounced on record but Shipp was on form and used many fast melodies influenced by his free jazz output. This transformed the mood of 'Outer' compared to the record but still blended quite well with 'Inner', particularly as the harmony and melody used live was much darker. All in all the performance was a great rendition of a great album and it was a refreshing change to hear the pieces in a different form.